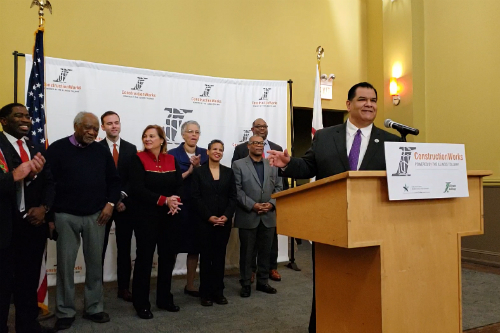 ­ SPRINGFIELD — Affordable health care, protecting immigrants’ rights, equitable K-12 funding, increasing public safety and creating more jobs will continue to be priorities for Illinois State Senator Martin A. Sandoval, who was sworn in for his sixth term on January 9. As the son of immigrant parents from Guanajuato and Michoacán, Mexico and Senate Majority Whip, Sandoval will continue to fight for working class people on the Southwest Side of Chicago and throughout the state of Illinois. Sandoval was first elected to the Senate in 2002. CHICAGO – Earlier this week, State Senator Martin A. Sandoval was joined by Cook County Board President Toni Preckwinkle, Representative Marcus Evans, Illinois Tollway Board Chairman Bob Schillerstrom and Executive Director Liz Gorman to announce the official launch of the Tollway’s new ConstructionWorks program. A program envisioned to help Illinois residents develop careers in high-demand labor trades that is now ready to begin serving job seekers at 18 sites in Cook County, DuPage County, Chicago, Rockford, Aurora and Waukegan. "As legislators, we always strive to expand access to opportunities for diverse communities. I applaud the leadership from the Tollway for their commitment to do just that,” said Illinois Senate Transportation Committee Chairman Martin A. Sandoval. “ConstructionWorks is a great example of what's possible when the public and private sectors work together to accomplish great things for the people of Illinois." Administered by The Chicago Cook Workforce Partnership, ConstructionWorks will provide free pre-apprenticeship training and support services to underemployed and disenfranchised residents, including members of minority groups, women and veterans, seeking training and career opportunities in the highway construction industry. During an initial three-year term ConstructionWorks plans to train at least 150 individuals, including laborers, equipment operators, carpenters, electricians, iron workers, cement masons and others to place them in construction projects as part of the Tollway’s 15-year, $14 billion Move Illinois capital program, as well as other capital projects advanced by Cook County, the Illinois Department of Transportation and transit agencies. Free services for job seekers will include access to a career coach and support services and assistance with transportation, child care, counseling services, as well as basic skills and adult education referrals.